“The Clymer Library Board of Trustees is pleased to announce the appointment of our new Library Director, Anne Hogya. After interviewing a number of qualified candidates for the position by our Search Committee, the Board unanimously approved their recommendation of Anne based on her 22 years of library management experience in New York and Pennsylvania and her commitment to furthering the community outreach and increased program development at Clymer. Anne has most recently been Library Director at both South Country Library in Belport, New York and Pittston Area Memorial Library where she introduced various education programs and tripled program offerings while overseeing construction of a new addition doubling the size of the library. Anne also has extensive experience in grant writing and other important fundraising activities needed to supplement tax revenue. She resides in Buck Township with her husband and is an avid gardener. A large group of patrons and friends assembled on Monday, May 15, 2017 to bid farewell to our Library Director, Laura Laspee, who will be starting a new position as Branch Library Director in Panama City Beach, Florida. 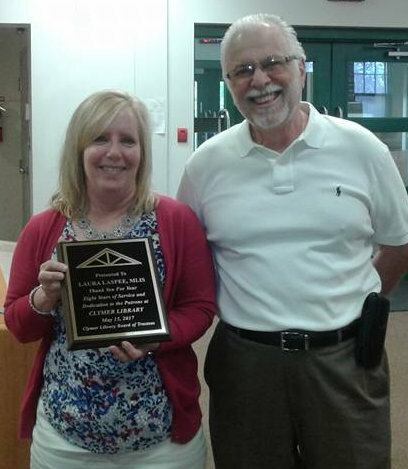 Board President, Frank Cacchione, presented Laura with a plaque from the Trustees as a small token of gratitude for her almost nine years of service and dedication to the patrons of the library and entire community. Laura will be missed and we wish her all the best in her new position. “The hours are too many to count. The quality of leadership was unsurpassed.” These are just some of the words of recognition given to Dr. Mark Tieszen for his years of service to the Clymer Library. Dr. Tieszen joined the board in 2008. He served as president of the board from 2012 to 2014 and chaired the board’s governance and facilities committees. As part of his governance duties, Mark participated in the process of finding new Trustees when terms expired. 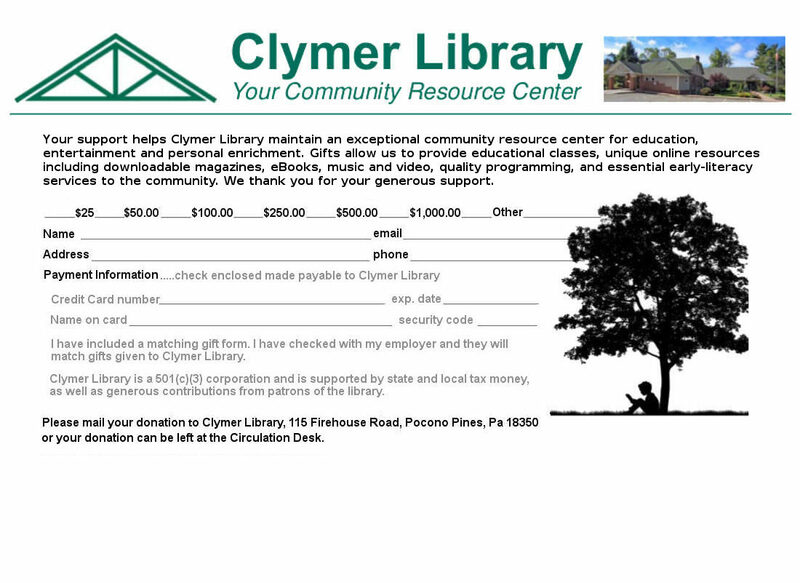 All trustees at the Clymer Library volunteer their time in support of the library. 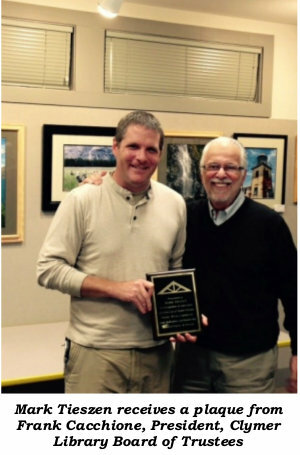 Mark has agreed to remain involved as a volunteer advisor to the library’s facilities committee. In December, the Clymer Library Board of Trustees recognized Ruth and Seth Isenberg of The Journal of the Pocono Plateau for their many years of support of the library. To honor the Isenbergs and the Journal, the library trustees purchased and installed a walkway paver at the library’s main entrance. Ruth serves as the Journal’s Editor-In-Chief while Seth is the General Manager. On hand to honor the Isenberg’s were Board of Trustees President Frank Cacchione, Board Secretary Melissa Laverty, Trustee Rick Bodenschatz, and Laura Laspee, Library Director. Bodenschatz said, “Our community is so fortunate in these days of reduced print media to have such a quality community newspaper serving our residents.” He further commended the Isenberg’s for their dedication to keeping the local community informed of the resources and activities on the Pocono Plateau. “As the library’s resources have grown with the community, the Journal has been an important part of spreading the message of the value of the Clymer Library,” said Bodenschatz. The Journal of the Pocono Plateau has grown over the years as a free weekly publication, and it now offers a quality electronic version to part-time and seasonal residents. The electronic version is emailed to subscribers for a very small annual cost.